Dr. 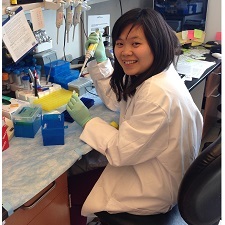 Vu is studying childhood acute myeloid leukemia (AML), a complex and heterogeneous disease. Despite exciting advances in our understanding of AML and the availability of more aggressive treatment regimens, ~30% of children still eventually relapse from this disease and there are yet no approved targeted therapies for children with AML. Her project aims to uncover the role of Syncrip, a novel RNA binding protein, in maintaining the leukemia stem cell in AML. The study will provide insights into the mechanism underlying the cause and development of AML and may lead to innovative therapeutic strategies and improved clinical outcomes for this deadly childhood disease. Project title: "Uncovering the role of RNA-binding protein Syncrip in acute myeloid leukemia (AML)"